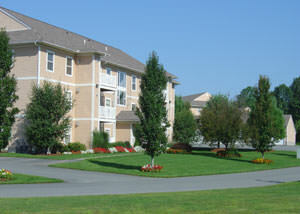 Briarwood Meadows is a large residential community located in Warwick, Rhode Island. The community was initially developed in 1990 and added to between 1995 and 2006. Construction was completed at 31 buildings consisting of 552 units. The final phase of construction included a state of the art Clubhouse with an expansive gym, an indoor pool and a clubroom that was completed in 2007. This, in addition to our outdoor pool and tennis courts provide some of the finest amenities available in Rhode Island. Our residences are beautifully appointed with gas or wood burning fireplace options, full size washers and dryers, a private patio or balcony, efficient heating, central air, walk in closets and vaulted ceilings in third floor units. At Briarwood Meadows we offer three floor plans. The one bedroom floor plan provides a separate dining area with a large picture window to enjoy our beautifully landscaped grounds. All of the two bedroom floorplans feature two full baths and offer privacy with bedrooms on each side of the living area. In addition, we have a select number of two bedroom/den residences available. The expanded space is often used for a home office or as a TV room. Contact us today to schedule an appointment to view one of our residences. 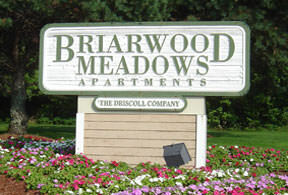 Briar Woods Medows is strictly a pet-free community.